I am so happy to be home from vacation. We have been away for exactly one month. While I loved every moment of our time with friends and family and I sincerely wish we lived next door to each of them, there is nothing as comforting as returning to one's own space, especially for an outgoing~introvert like me. I need my down-time, my sacred time alone with my family of choice: my books, my blogs, my pens and journals. Yet, as I poured only one cup of coffee this morning (rather than the three or four for my relatives over the past thirty mornings)I found myself a tad lonely. Oh the contradictory nature of living far from those you love the most. Selfishly loving the freedom and independence it allows while missing being a part of their everyday lives and sharing the beauty of simply being in their presence. 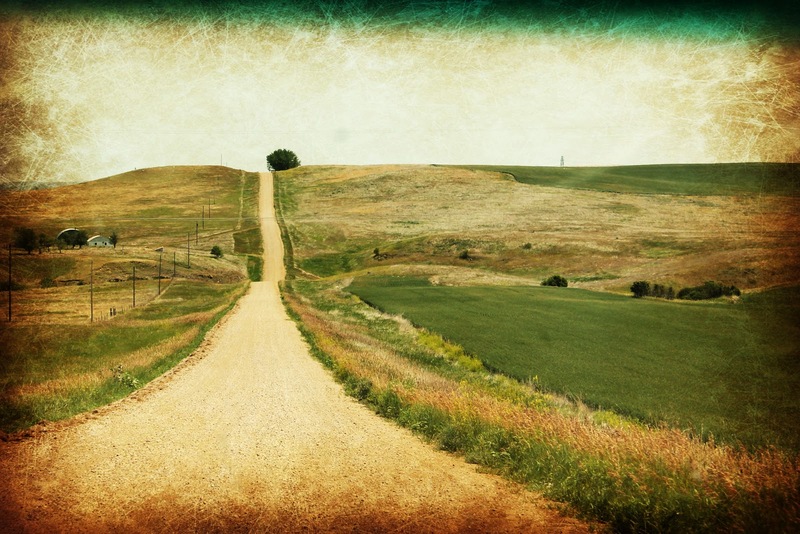 The photo above is one I snapped through the windshield of our car as we bumped along the gravel road to visit the several North Dakota farms in my husband's family. Miles and miles of roads like these section the land where our ancestors made their new homes following the one-way trip from Russia via Ellis Island. One can only imagine the courage it took to travel so far with only two suitcases per person, to an unknown, unseen territory and believe a better life was possible. My own husband is the first generation to not be born in one of those farmhouses, the first to leave the homestead state entirely and make his own path toward an unknown future. Will our own great-grandchildren re-trace our paths someday as well? Wow...I love this pic! I had to laugh since I was just discussing introverts last week on my blog since I was reading "Quiet: The Power of Introverts in a World That Talks Too Much". I would feel the same as you. Hi Theresa - good to hear from you! Do you like that book? I have picked it up at the store and put it down several times because it doesn't seem like an easy read for the summer! Gorgeous picture. I also live away from family, and can totally relate. Lately, I have been on the lonely side, but i don't think I could visit for a month! I know what you mean. I wondered if we would all get tired of being together but when you have to drive 1,800 miles one way to see them, you think you should stay a while! beautiful photo...identifiable feelings. Loved, thank you for sharing. Welcome home, Misty! Happy to hear you had a wonderful trip. What a gorgeous photo, what a gorgeous place! Beautiful, I know just the feeling. We live many states away from our family too. Wow! It's got such a poetic feeling. Blessings! Nice photo! I love the border.